Thank you for your interest in my Mediterranean Olive Salsas. My family and our hard-working team work diligently to bring you unique, fresh products made with care in small batches. I am a very ordinary woman. I am the mother of two fantastic sons. I love music and beauty. I find joy in the comforting and creative things of life: cooking a beautiful meal for friends, quilting, singing and gardening. When I graduated with a music therapy degree, I did not imagine a future in food creation, production and sales. It is often in the pain of life, not the comforts, that change is birthed. This severe pain was felt when I found myself unemployed and my strong, athletic son was paralyzed from the chest down in a serious car accident his senior year of high school. These two life-changing events were the catalyst for exploring new ways to provide income to my family and needed the flexibility to take care of my son. 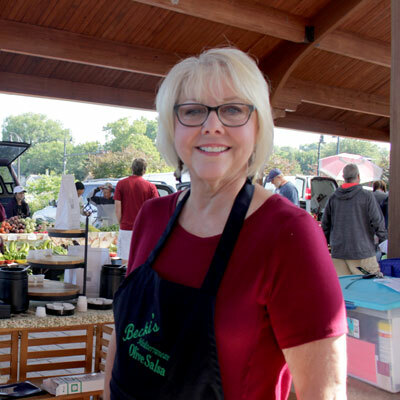 With prompting from friends, I started making Becki’s Mediterranean Olive Salsa and selling it at a farmer’s market. I was unsure if I could even sell a dozen that first day, but sold 87 in the first two hours and had to go home early. Thanks to a few key retailers who gave this small, women-owned company an opportunity, we started selling to retailers in Wisconsin and the Twin Cities of Minnesota. That was 10 years ago and the rest is history and that story is still in the making. Our salsas are made to order at our own Midwest kitchen based in Eau Claire, WI. My new partner brings over 30 years of experience in the grocery business and we now have the ability to scale these products as needed to meet current and future growth.